I was thinking of using a birdcage to hold the gifts and cards that ppl bring to the reception so I urged fiance to find one while we were at a rummage sale in NJ back in May (I was busy pillaging the jewelry section in hopes of finding something for the wedding, to no avail). Not knowing what kind of birdcage to get, he radioed me that there were only huge ones, mostly ugly. I later learned that he was looking at real, functional birdcages, like the rectangular ones used in pet stores, not anywhere near decorative. Thank goodness he didn't get one of those. 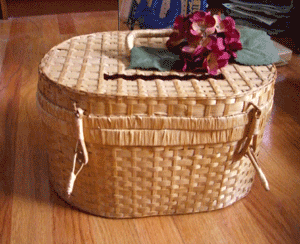 Instead, he bought this cute wicker basket for $3. Today I finally decided to cut a slot into the top and finish it off with a few sprigs of the leftover silk hydrangeas and a leaf or two. All that remains is to secure it shut at the closures by either using plastic ties or some kind of wire. Note, if you ever want to do this, I recommend using some sort of serrated blade to cut through the wicker. At first I used a box cutter, jig saw, and then some all-purpose serrated knife that my brother once bought on a whim. I thought that the weave of the basket would be compromised once I removed a few of the slats but it seems like they glued it at each intersection so it's still stable.